The California Social Work Education Center (CalSWEC) Public Child Welfare program was established to increase the availability of professionally trained social workers and child welfare staff in public social services in California. 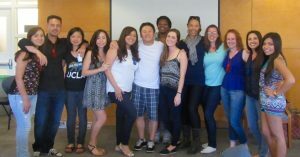 With federal Title IV-E funding, CalSWEC provides stipends for 24 students in the full-time MSW program at UCLA. These students will intern in Child Protective Services and then work in any California County CPS setting, including L.A. County DCFS, after graduation. A second Title IV-E stipend program, UCCF, provides another 16 stipends and these students will agree to work in L.A. County DCFS upon graduation. Both PCW, Title IV-E stipend programs are similar in terms of academic expectations and overall experiences. The difference would be that internship and payback are with L.A. County DCFS for UCCF and PCW CalSWEC internships and payback are typically with L.A. County DCFS but payback can be in county protective services throughout the State of California. Why should I choose PCW, Title IV-E, CalSWEC? If you are an MSW candidate with a strong interest in pursuing a career in public child welfare, then CalSWEC is an opportunity to subsidize your education. CalSWEC is a two year stipend program that offers $18,500 per year. Students who receive this assistance “payback” the stipend with two years of employment at any public child welfare (PCW) agency in the State of California. Students interested in working with Native American populations have more payback options. 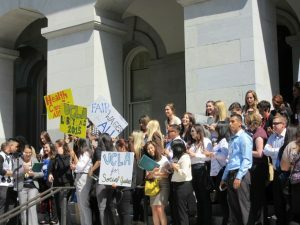 CalSWEC attempts to recruit students who reflect the needs and ethnic makeup of the public child welfare client base. A preference is given to candidates who are current public social services and public child welfare employees. How do I qualify for PCW CalSWEC? First, candidates must be admitted into the UCLA MSW program. All accepted students are sent a PCW Title IV-E stipend application. Candidates who indicate an interest in work with the Children and Youth Services or with high-risk children and families, are encouraged to apply. The Title IV-E CalSWEC PCW Stipend program requires that students who are awarded a stipend agree to work in child protective services within California for the same number of years they received a stipend. Therefore, students must be able to work in a California upon graduation. At this time U.S. citizens, permanent residents and DACA students with work credentials are included. There is a two-part application process that involves a written interview and an oral interview. Generally, this is a rolling process, in which applications are processed as they are received, that begins in April and typically ends in June. Written: The application includes questions about your understanding of PCW CalSWEC requirements and public child welfare goals. Oral: The interview will explore your interest and experience working with this population. The oral interview panelists are PCW Title IV-E faculty and often a current county public child welfare supervisor. The preliminary selections are confirmed by the PCW Title IV-E Awards Committee. Official PCW CalSWEC award notifications are determined in July. What options do I have and what are the course requirements? PCW CalSWEC students can choose to be in any of the Social Welfare Departments’ concentrations. They will participate in all generalist social welfare classes and then specialize in children, youth and families in addition to taking specialized PCW courses. CalSWEC PCW placements are typically within the greater Los Angeles County area. Specialized 1st year placements are usually in child and family mental health, family services, community agencies specializing in high-risk youth and family populations, occasionally in school or health care settings. Second year placements are most often at L.A. County DCFS. There are times when placements can be arranged in surrounding counties. Do you have a part-time program? No, we only offer a full-time program at this time. What have former students said about CalSWEC? The following list represents placements the PCW CalSWEC program has used in the past, although agencies may change from year to year. Students are placed in their first-year placement by a field education team. The second-year placement is chosen by the student and field liaison after an interview process. 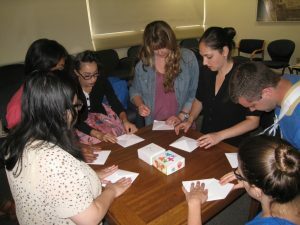 The Department of Social Welfare typically places first-year PCW, Title IV-E, CalSWEC students in child and family nonprofit agencies like the ones listed. The second-year placement is in a child protective services setting. Second year internships are usually in Emergency Services or Continuing Care Services, Los Angeles County Department of Children and Family Services. Sometimes there is availability in a surrounding county protective services setting for PCW CalSWEC students. All first-year placements are considered to be generic; the emphasis is on direct (micro) practice. Students are required to complete a macro (advocacy, administrative, etc.) set of tasks or a unique project in the first year internship as well. In the second year, internship students will learn about ER, Continuing Services and sometimes Adoptions, in child protective services. They will also engage in a specialized evidence based research project with a faculty mentor that can be focused on public child welfare issues. El Nido (Carson): This satellite program of the El Nido Family Service Network is a strong example of a small community counseling program that has a significant impact on the area in which services are provided. In addition to providing child, adolescent and family out-patient services, this program has been a leader and innovator in developing specialized groups that operate in the local schools. Aviva Center Counseling Services: This program provides in-home support, parenting, and counseling services to children, adolescents, parents and foster parents of kids being provided with intervention through the LA County Department of Children and Family Services. In addition, services are provided at the schools for certain children and/or at vocational sites for teens in after-school programs for high risk youth. Aviva Center spent a considerable period of time developing a model for preparing the first year student to eventually deliver services in the homes and schools of child welfare children and families provided with support, educational, and counseling services. This model involved teaming students with assessment, case-management and therapeutic staff of cases and eventually providing students with primary case-management and therapy roles. Students also participated in developing a group for high risk adolescents as a part of their job corps program. In addition, the students interacted with DCFS case workers and other providers on each case and did several reports with recommendations about visitation, therapy, and custody for the DCFS workers to use as documentation for their own comprehensive recommendations in their court reports. 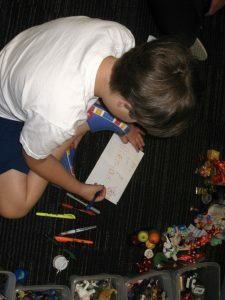 Long Beach Child and Adolescent DMH: This program provides crisis intervention and on-going therapeutic services to children and adolescents who are identified as struggling with serious emotional problems, often emotional problems that will be a part of their experience throughout their lives. In addition, these children and adolescents are growing up in an ethnically diverse and impoverished area of Long Beach, frequently in homes where substance abuse, unemployment, and complicated immigration and naturalization issues are present. Our students have an opportunity to develop assessment and intervention skills with these children and families that involve a full range of out-patient options, day-treatment services, and case-management and multi-disciplinary team collaboration. Students have also participated in the development of specialized groups and resource materials for the clinic population. Foothill Family Service: This program maintains a child, adolescent, adult, marital and family out-patient program. In addition, this Family Service agency realized many years ago that it was critical to continue to evaluate and to develop programs relevant to the changing community. The CalSWEC students participate in developing and providing different individual and group services to children in the local schools. 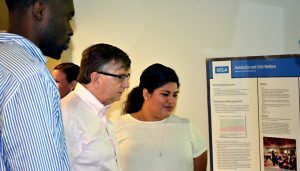 Our students have been critical to developing specialized community outreach to the mono-lingual Hispanic community and they have contributed to the development and implementation of a ‘Family Safe’ and ‘Dinners on the Table’ programs to assist both parents and children at risk of future difficulties and placement. This is accomplished through a supportive model of intervention which combines education, communication and problem solving skills, learning from peers, mentoring, and preventive services for multiple family groups that often involve families with three or more generations participating at one time. Edelman Community Mental Health Clinic, Los Angeles County DMH; Harbor/UCLA Department of Psychiatry, Los Angeles County DMH: This program contains services for Adults with persistent and chronic mental illness, those with dual diagnosis, parents and children who are a part of the CALWORKS intervention programs in Los Angeles County, and children and teens with serious acute and chronic mental illnesses. 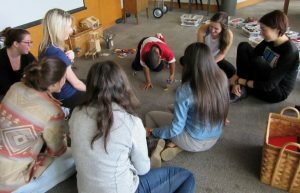 Interns within this program develop many important assessment and interventions skills with both adults and children who are at risk for or who have been in placements of various kinds and who struggle with mental illness, substance abuse, and are exposed to and suffer from the effects of family violence. Students develop clinical practice skills, case management, collaboration, program development and evaluation skills in addition to doing community outreach. Long Beach Asian Clinic Services, Los Angeles County DMH; Coastal Asian Community Mental Health Center, LA County DMH: This clinic serves a number of Asian immigrant and non-immigrant groups that live and work in the surrounding community. It is a facility that was developed by the county to house a number of professional and community workers with specialized knowledge and language skills. There are workers who speak Lao, Cambodian, Vietnamese, Korean, Japanese, Mandarin, Cantonese and share other language and cultural experiences with the clients served. In addition to having a family member with a severe and persistent chronic mental illness, the families that attend the clinic are often from war-tom countries and a part of refugee groups who have been subject- ed to torture, witness to mass murders, and who have lost their connections to family, work, and homeland that is core to their self identity and sense of community. Our students become involved in all aspects of traditional and innovative community outreach services. Kaiser Permanente Watts Counseling and Learning Center: At Kaiser Watts, students are able to become immersed in the provision of traditional and innovative services to children, adolescents, emancipating minors, adults, and families. At the same time, our students are able to see and participate in the many challenges that lie in maintaining a relevant community service under the umbrella of a large HMO administration. Students have participated in developing community outreach services and in providing resource guides and information that supports the centers attempts to define itself within the parent organization. Venice Family Clinic: In this facility, our students become a part of the social service program of a family health center. As a result, they participate in evaluation, brief treatment, longer term interventions, and in the development and implementation of educational and support groups. Students see a range of child, adolescent, and adult living and emotional stressors often related to a primary health concern. Our students often work with bi-lingual or mono-lingual pregnant Hispanic mothers-to-be. As a result of some of the needs that have arisen in this work, over the last several years our students have participated with another staff member in the development of literature and services for Spanish speaking women who are the victims of spousal battery. Project Impact: This agency contains a juvenile diversion program which provides an opportunity for students to run prevention groups at schools and the agency. Project Impact is also a “hub” for the Family Preservation Program, hence students placed here come to understand how this large community treatment program is administered. Students participate in providing services to the juvenile diversion teens and their families, they also work with the parents and children in the Family Preservation program. In addition the students assist with the development of program services and grant applications for both programs. Vista Del Mar: This facility has been a hub for developing innovative programs that focus on high-risk child and family services. Students intern in a specialized school based, non-public school program that provides educational, mental health, peer support and case management to children and teens with specialized needs. PCW CalSWEC Student Placement and Training: PCW CalSWEC students are placed in Emergency Services, Continuing Case Services, or sometimes in Adoption Services within high needs offices designated for UCLA Title IV-E interns. Students work with a primary Field Instructor who is a supervising social worker and with preceptors or case carrying social workers. They also have a series of trainings and group meetings sponsored by L.A. County DCFS Education and Licensing. These trainings cover a range of specialized topics like safety assessment, child abuse evaluation, child sexual abuse, domestic violence and substance abuse in addition to learning to document case notes and court reports. Foster Family Agency Management: The student placed here learns macro practice skills in managing the issues that present when a public agency contracts with nonprofit community agencies to run their own foster homes. Student reviews contract compliance, proposal, outreach and training issues. from IV-E regulations as well as how the agency insures compliance with IV-E requirements. Student is also involved in research (e.g., recent time study on caseload issues). Region IV Headquarters: The student(s) placed with this administrator learn a variety of macro and micro skills ranging from accompanying the administrator to high-level community meetings (e.g., child death review) and studying various management styles and practices to providing direct FM or FR case management services. Training: This unit provides experienced stu- dents with an opportunity to conduct a needs assessment and develop and deliver a training to a segment of public child welfare workers. Students are also required to make recommendations to training managers about modifying current in-service trainings offered experienced workers. Some trainers have a specific interest in areas such as domestic violence; students placed with these trainers have a unique opportunity to prepare and deliver curriculum for this specialized area. Adoptions: This unit prepares a student for all phases of direct practice adoption work. Student manages several types of cases and follows an adoption from inception to the final hearing. Policy Bureau: This unit prepares students for understanding the agency’s process for writing and revising policies. Students conduct research, analyze legislation and evaluate options. They are required to draft a policy bulletin. Adoptions: This unit prepares a student to understand all phases of direct practice adoption work. Students follow an adoption for the length of their placement, performing all direct and indirect services required of a case-caring worker. Medical Placement: Students in this setting carry cases of medically fragile children who understandably have special needs. Healthy Start: Students in this setting provide largely prevention work, diverting children from the public child welfare system while providing direct and referral services. For this reason, cases from Emergency Response, Family Maintenance, Family Reunification, and Permanency Planning (these are the four main services provided by any public child welfare agency in the state of California) are selectively added to this experience. Program Development: Students work on assignments to develop new pro- grams/responses for organizational needs. They are responsible for searching out and following legislation that might provide additional resources to the agency. Once a program is developed, they collaborate with a team on implementation and marketing. As with the above placement, students here must also carry a few client cases to enable them to understand the issues associated with carrying a caseload as an entry-level child social worker. CWS-CMS Compliance: A student in this function conducts research on how workers are utilizing this statewide computerized information system. The student also provides feedback to the manager, recommending modifications and conducts, additional one-to-one training, etc. Students placed here have also had a preceptorship in another unit in order to have the direct case management experience. Susan Snyder ’01 wholeheartedly recommends CalSWEC and a job in public child welfare to interested students. She says that in her work in the Los Angeles County Department of Children and Family Services Emergency Response Unit, she sincerely feels able to make a difference and have an impact on children. “Nothing compares to that,” she says. 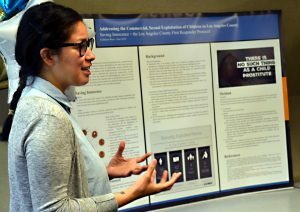 UCLA’s CalSWEC program gave her the fundamentals that she honed into her current assessment skills, which she uses in investigating allegations of child abuse. She was grateful for the CalSWEC experience, which allowed her to take classes geared toward learning about public child welfare and gave her access to professors who are knowledgeable about work in that field. When faced with a serious dilemma on the job, she says she tries to imagine what her CalSWEC professors would do in that situation, and that thinking guides her decisions. Susan is very satisfied with her choice to work in public child welfare – she truly feels that she is making a difference and that she can see the tangible, positive results of her interventions with children and their families. Corey Hanemoto’s ’97 job with the Los Angeles County Department of Children and Family Services (DCFS) is a little different than many other former CalSWEC students. Corey is a program analyst for the Adoptions Division, where he is responsible for the management and organization of a range of data, such as averages for the time it takes to move a case through a finalized adoption. 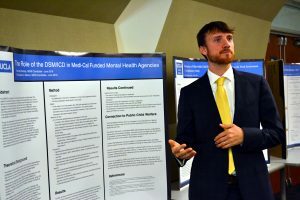 Corey describes his job as going beyond case management, and says that he uses the expertise regarding public child welfare that he gained in the CalSWEC program as a filter for organizing the mountains of data that come across his desk. He believes that his learning in the CalSWEC program has enabled him to navigate a large organization and taught him the basic policies and practices of DCFS, but also gave him skills he could use in any job he might choose to do. Corey is extremely satisfied with his career choice. He enjoyed his early experiences as a case-carrying worker, but believes that what he does now has a greater impact on the families and children served by DCFS. The data he develops leads to the implementation of plans and policies that have lasting positive impacts for clients. Corey’s greatest motivation to continue his work in public child welfare is the continued opportunity to learn on the job and try new things. “It never gets old,” he says. Stan Esperon ’98 has been working in the Los Angeles County Department of Children and Family Services Adoptions Unit for five years, where his job is to develop permanent plans for children who may not be able to return to their families of origin. He finds great satisfaction in aiding kids find permanency – kids who would otherwise languish in foster care. 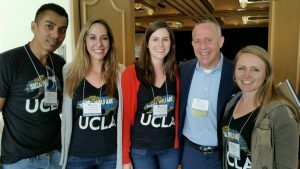 “Stan credits his UCLA education with teaching him to look at the overall picture when working with a child or family, paying attention to the effects of the environment on both. He recommends CalSWEC to students interested in working in public child welfare because of the support he received from fellow CalSWEC classmates during his time in school. He enjoys the challenge of working at a large public child welfare agency, where he says he is constantly learning. Stan acknowledges that the work can be frustrating at times, but makes an effort to stay focused on the positive. An example of how he maintains this focus is by attending the hearings where adoptions he orchestrated are finalized. “What I do does make an impact,” he says, and seeing his clients achieve permanent homes makes that clear. For a year prior to her entry into UCLA’s MSW program, Gloria Escamilla-Huidor ’99 worked on the front lines of Children’s Services in San Diego County’s Health and Human Services Agency. “I didn’t know what I was getting into,” she says, and explains that she felt unprepared to perform such an important job. Gloria decided to enter UCLA’s CalSWEC program in order to learn more about the theories and research that govern child welfare practice, so that she could be a more effective and responsible child welfare worker. Participating in CalSWEC was, “the best choice I could have made,” she says. Gloria returned to Children’s Services in San Diego after completion of her MSW, and just recently began working in the Interstate Compact for Placement of Children, a unit whose purpose is to protect dependent children placed outside the state of original jurisdiction. In that unit, Gloria coordinates placements for children coming to San Diego from other areas or for residents of San Diego who need to be placed elsewhere, in ad- dition to assisting with independent adoptions. She feels very satisfied with her career choice, where she has not only the opportunity to aid children in need of protection, but also the opportunity to assist families in working through the problems that led to abuse in the first place. In this way, she sees herself creating a more stable and healthy family environment for children to return to. 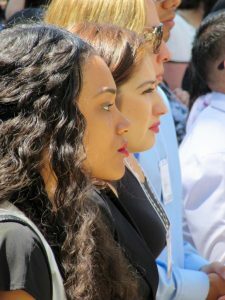 She, like other former CalSWEC students, points out that in a job in public child welfare, one is never bored, is always learning, and has the opportunity to grow and change professionally. Gloria knows that she is making decisions on behalf of children that will lead to a more positive life experience for them, and focuses on those differences to stay motivated in her work. She also points out that having peers in social work (her husband is also a social worker, who was in the UCLA program with her) with which one can discuss the challenges and triumphs of the work can be an amazing source of support. All UCLA Faculty are involved in the training of CalSWEC students. The Public Child Welfare Curriculum Planning Committee assures that the specialization requirements reflect practice needs. The faculty who anchor the Public Child Welfare Curriculum Committee include Laura Alongi, L.C.S.W,. Alfreda Iglehart, Ph.D., Todd Franke, Ph.D., Department Chair and Principle Investigator, and Gerry Lavina, L.C.S.W., Director of Field. Poverty, Inequality and Firearm Violence, Speaker: Mark S. Kaplan, Dr.P.H. Download a brochure about the CalSWEC program. Download the recent Public Child Welfare newsletter here.